Two Studio Apartments Škorić (Studio App 1 with Balcony and Sea-view & Studio App 2 with Terrace) are located in Volosko, unique part of the city Opatija, which used to be fishermen village. Our studios are placed only 50 m far from the sea. In its surrounding there are grocery shops and some very good restaurants, we could say they are the best in Opatija and it’s area. 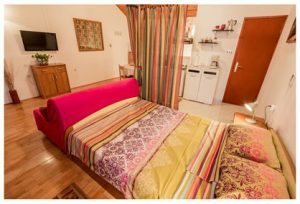 Studio App 1 with Balcony & Sea-View consists of a room with a double bed and a supplement bed (pull-out sofa), kitchenette, bathroom (toilet/shower) and a balcony with great sea-view. It is equipped with SAT-TV, air-condition and wireless internet (WI-FI). has everything like the Apartment Studio 1 except the balcony and the sea-view. Instead of the Balcony, it has a terrace (no sea-view). We’ll be available to offer you any help throughout your entire stay. Volosko is unique part of the city Opatija. It used to be old fishermen village. Our studios are placed only 50 m far from the sea (beach). In their surrounding there are grocery shops, coffee shops and some very good restaurants (Plavi podrum, Moho, Tramerka, Skalinada, Ribarnica, Valle Losca), we could say they are the best in Opatija and it’s area.